Attorneys Michael Glover and Jason Engkjer have joined Lommen Abdo, bringing additional strength to the firm’s business and litigation practices and expanding its transportation law practice. After over 25 years representing motor carriers, freight forwarders, shippers, logistics providers and businesses, Michael Glover has moved his practice back to downtown Minneapolis to offer greater business services to these clients at Lommen Abdo. “I am excited to be able extend to my clients the services that Lommen Abdo provides, including its terrific trial practice, tax, intellectual property and sophisticated business practices.” Growing up with the household goods transportation industry, Mike started his representation of transportation entities and businesses with transportation needs in the early days of transportation deregulation. Responding to the changing times of shifting governmental regulation, technology advancements, and human resource training and management, Mike grew his practice to help small businesses become medium sized businesses and medium sized businesses become larger businesses. In addition, Mike works with his clients in other industries ranging from athletic training, manufacturing, construction, financial services, insurance, warehousing and order fulfilment in the areas of collection, litigation, employment, insurance coverage and general business law. Mike is active in the Minnesota Trucking Association as a speaker and working committee member and also participates in the nationally-based Transportation Lawyers Association. He serves as the President of the Hopkins Education Foundation and is a member of the board of the Jack Jablonski Bel13ve in Miracles Foundation. Jason is active with the Minnesota Trucking Association, North Dakota Motor Carrier Association and Transportation Lawyer’s Association. He is a former board member and general counsel for the Epilepsy Foundation of Minnesota and remains active supporting the organization. Jason is also a current board member and general counsel for Farm Rescue and Farm Rescue Foundation. He regularly provides volunteer pro bono legal services through LegalCORPS and currently serves as an ethics investigator for Hennepin County’s Fourth District Ethics Committee. 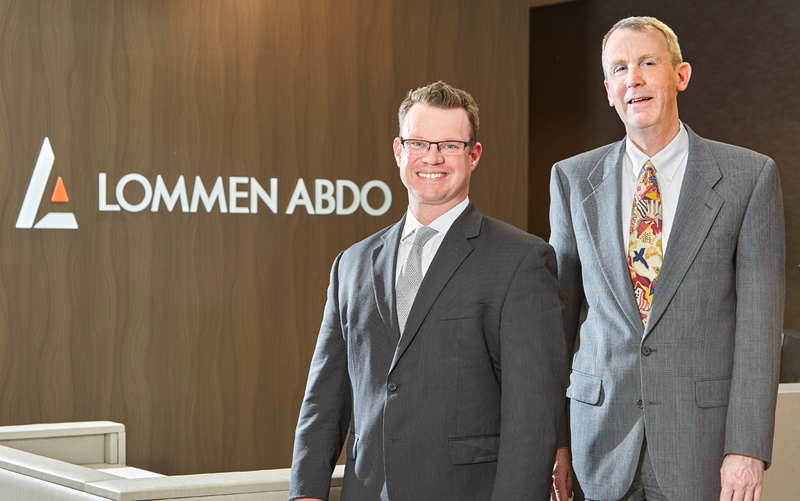 Mike’s and Jason’s practices will now have the added support of Lommen Abdo’s 35 attorneys located in three offices: Minneapolis, Hudson and New York City. Lommen Abdo has attorneys in a variety of practice areas including business, employment, real estate, family law, estate planning, personal injury, vaccine injury, appellate advocacy, intellectual property, entertainment and more. If you have a need outside of Mike’s or Jason’s expertise, they can connect you to the right person to handle your matter. Lommen Abdo attorneys’ best credentials are our clients’ successes, but our lawyers are also recognized by their peers: 19 are AV-rated by Martindale-Hubbell, five have been selected for inclusion in The Best Lawyers in America®, 13 are included in the Super Lawyers list and many have obtained certifications in trial practice and real estate.